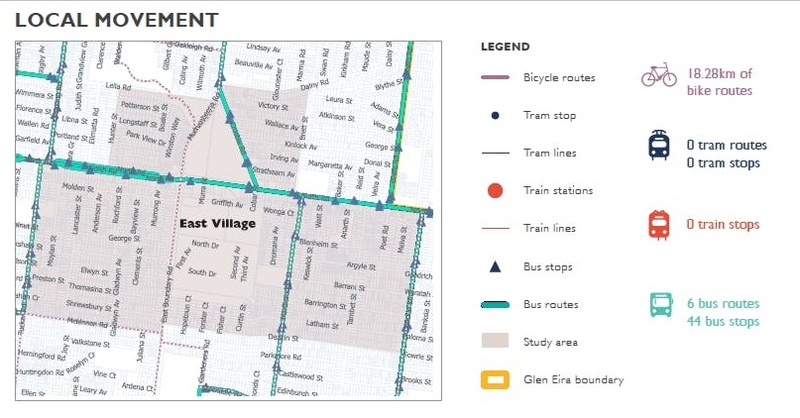 Glen Eira Council, working in conjunction with the VPA (Victorian Planning Authority), is undertaking Community Consultation on the proposed massive East Village re-development and is asking residents to “Tell us what you would like to see” included in the development. To assist residents preparing their submission, below is the submission lodged by GERA. Although a “brown field” site, to ensure future development results in a sustainable, socially and economically viable community that enhances the surrounding area, the site should be viewed as “green field”. Vehicular and pedestrian access to the site and the site’s facilities, are key to determining the viability of the redevelopment. The creation of precincts (ie. 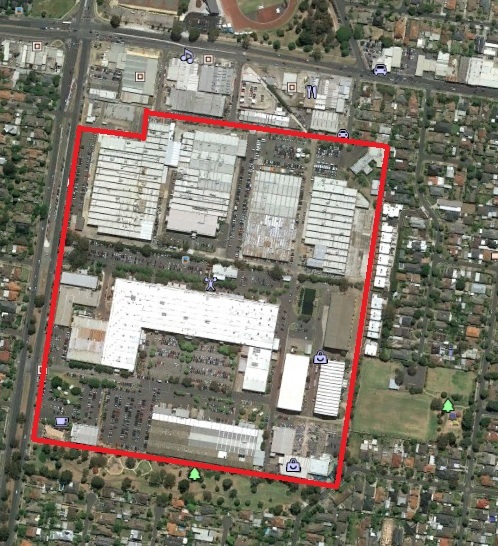 designated areas within the site that provide various community oriented facilities or business focuses) is good, however, determining the location and heights/densities of precincts based on the site’s existing internal road network may not result in a desired community outcome. Building Heights/Densities – ranging from 2 to a “core height” of 8 stories. Refer to below illustration (previously presented in November, 2016 presentation) for clarification on indicative heights/densities. Retail and Commercial areas, including shops and stores as per planning definitions (GE Planning Scheme – Clause 72). 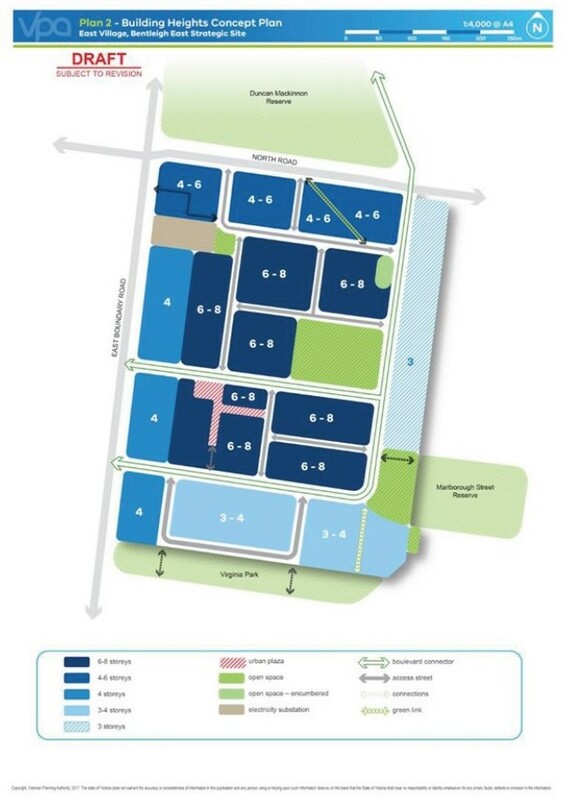 To become a centrally located, vibrant village hub. All residences to have private open space (eg. courtyard at ground level, balconies at higher levels). Density levels defined and applied to site. Diversity of housing types (townhouses vs. apartments) and sizes (1,2, 3 bdr). Ratio specifying no. of 3 bdr to 1 & 2 bdrs dwelling defined and applied. Mandatory requirement for inclusion of social housing. Precincts/Areas differentiated by architectural variations and landscaping. Road accommodating bus route to accommodate bus stops without impacting traffic (vehicle and cyclist) flow. Vehicle movements to/from site impact on existing traffic congestion in North and Boundary Roads to be minimized. Given the magnitude of the site, medium density development will generate a substantial increase in the demand for, and usage of, surrounding parkland. The proposed Open Space Levy of 6% (being marginally higher than that charged for smaller developments – 5.7%), is felt to be inadequate to meet the open space needs of the future residents. A more appropriate levy would be 8-10%. At tonight’s Council Meeting, the proposed partnership agreement with the Victorian Planning Authority for the East Village Development Site was amended and approved. The amendment includes significant and effective community engagement during the developments planning process. Congratulations to Council for hearing the call and to residents for answering the call to action – it’s a good outcome. Hopefully, it bodes well for future community engagement. The purpose of this report is to seek Councillor endorsement for a proposed partnership with the Victoria Planning Authority (VPA) to assist Council to undertake the structure planning and preliminary planning for the ‘East Village’ site. For those not aware – the East Village site (24ha or 240,000 sqm) is an expansion of the previously rejected Virginia Park Re-development Proposal (12.3ha). Located near the corner of North and East Boundary Roads, development of this massive site is severely constrained by the site’s limited vehicular and pedestrian access and a lack of accessible public transport. Development Planning to be completed by September, 2017 with community consultation occurring after Structure Planning (May/June) and after September. While GERA welcomes the recommendation for VPA involvement (it brings to the table a level of expertise and resources that quite simply are beyond the usual planning functions of Council), the report raises significant concerns re community engagement. Such a massive site has far reaching and potentially adverse implications for the surrounding community. Therefore, it is extremely important that open and transparent community engagement is embedded in the development planning process. Unfortunately, neither the Officers Report nor it’s attachments provide details on how such community engagement is to be achieved. Officers reporting to Council at key decision points or Council presenting completed plans (“done deal”) for residents to comment on does not constitute good or appropriate community engagement. That a decision on this proposal be deferred at this time so that Councillors have more time to consider the proposal and how best to actively provide for community input during the development planning process. Residents to contact all Councillors (email and/or mobile) prior to Tuesday’s Meeting, to urge them to support the proposed amendment. Remember – the strongest message is numbers, your support in contacting Councillors is vital. Sample email – feel free to cut and paste. While I welcome the recommendation for VPA involvement, Agenda Item 9.2 raises significant concerns re community engagement. Such a massive site has far reaching and potentially adverse implications for the surrounding community. Therefore, it is extremely important that open and transparent community engagement is embedded in the development planning process. Unfortunately, neither the Officers Report nor it’s attachment provide details on how such community engagement is to be achieved. Officers reporting to Council at key decision points or Council presenting completed plans (“done deal”) for residents to comment on does not constitute good or appropriate community engagement. Members of the community are invited to attend an open forum on Tuesday 6th December to discuss the East Village draft masterplan. It will be held from 7-9pm in the meeting room at Duncan Mackinnon Reserve Pavilion. The forum will be run as a Q&A, so people are encouraged to come along and ask their questions. Wednesday, 23/11/2016 – 5.30 – 7.30 p.m.
Saturday, 26/11/2016 – 2.00 – 4.00 p.m.
GERA urges residents to attend the information sessions and review the supporting documentation. Given the magnitude of this development, residents need to become aware of what is being proposed to ensure that appropriate and informed feedback is provided to the developers and Council. 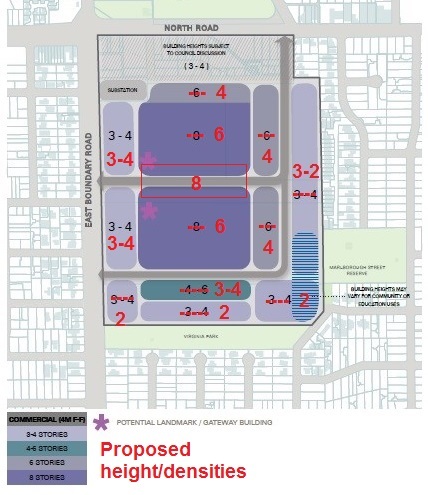 GERA will provide our assessment of the current development proposal in subsequent postings. Updated Concept Plans for the major “ East Village” commercial, retail and residential development (20.2 ha or 202,400 sqm) have recently been released. 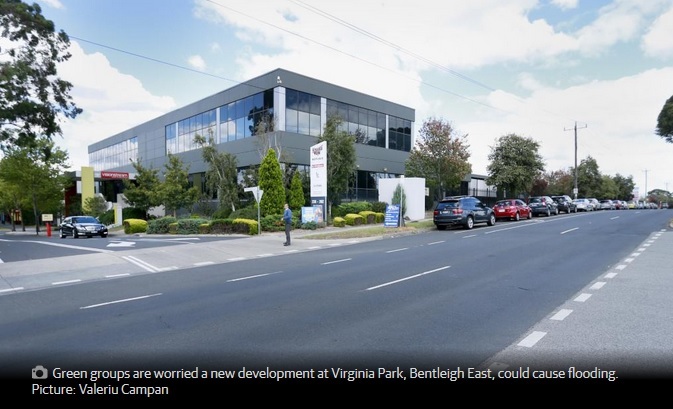 The “East Village” site is located on the current Virginia Park Industrial Estate on the eastern side of East Boundary Road (near the North Road intersection) in Bentleigh East. The site has poor access to public transport and, with the exception of East Boundary Road, has limited vehicle access. a limited commercial (ie. employment opportunities) component. These plans were rejected by Council in July, 2015, and the developer proposed to undertake a process of community consultation to ensure that the current and future needs of the community were provided for, prior to submitting amended development plans. 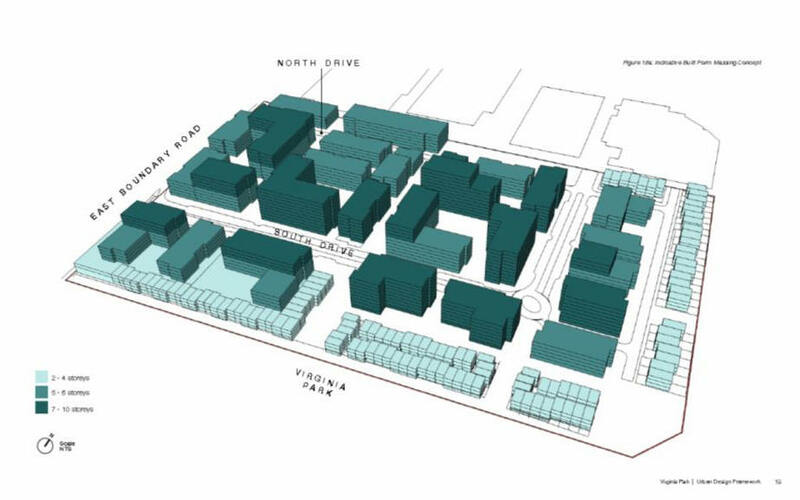 These East Village Concept Plans are being strongly criticized by residents as being little more than a “public relations exercise” designed to assure Council that the proposed development is supported by residents. However, residents advise that, aside from an increase in the size of the site and the absence of any quantitative information, they see little change to the plans rejected by Council almost a year ago. Residents are withholding their support/comments until more substantive plans, which quantitatively show how the community’s needs are to be incorporated in the development, are released. “Having read the document I have concerns that this is just a PR exercise to convince councillors that this time they have the public on side. The mere fact that it has been renamed the “East Village” worried me from the get go. The term conjures up shops, businesses and housing before any sod has been turned or any plans are prepared. It is meant to soften the attitude of both residents and council. I fear that this has happened during the recent phases. In my view nothing has changed – the proposals still concentrate on providing a revamped business park with multiple housing. But they do not mention the number of dwellings this time or any specific business type – such as specialty shops or convenience grocery shopping. Their terminology of “Establish Retail Development” is hiding their real intent. Reading each plan gives the reader a sense of ease that low to medium housing will be provided around the fringe. But reading further the proposal is to still have housing throughout the entire complex. If the frightening thought of the previous proposal of 4,600 dwellings was a real one, then this current, expanded proposal has the capacity to possibly add another 2,000. Besides what the hell is low and medium density in terms of the number of houses and people in real terms. Just two terms used to soften the understanding of real numbers in my view. It’s the same directions as the previous stuff, only lager. 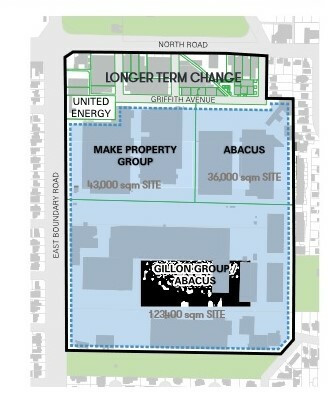 And although Gillon and Co. have not specifically stated anything about it in regard to further directions to North Rd except to say “Incremental Change To Existing Services” I can imagine that Business and Housing will eventually be proposed to complete this “False Activity Centre” or “False Urban Village” that is being conceived and born from this confused location of Commercial Zones. The traffic generated from this larger concept will be much worse than the previous proposal along with parking issues already noted of concern. While an additional intersection at North Road is merely mentioned as a possible outlet, in reality it will not give a great deal of relief, in my opinion, because the local road leading to North Road from the site is small in width and will not allow a significant traffic flow to warrant a decision not to use the two East Boundary Road locations. So parking and traffic issues will be increased along with over saturation of housing. Nothing is changed. Whilst there is mention of tree a lined East boundary Road and the main Internal Roads along with some minor key new public open space, I don’t believe that the thought of profit over amenity is at the forefront of this developer’s mind. It’s an attempt once again to show that they have listened and provided for something that the masses wanted. With all due respect to those seeking the inclusion of a school, I for one do not wish a school to be located on the site. I understand all the reasons why folks would think a new school is needed. Schools generate traffic during two peak times and this will add to the traffic problems on East boundary Road along with parking. As a resident of East Boundary Road I admit I am totally selfish with my view on this one. No doubt, the East Village development (which dwarfs the Caulfield Village development) will remain a highly contentious issue (both the short and long term) as the planning approval process continues. And no doubt we’ll continue to update readers on progress. The following is a brief outline of the planning processes that have occurred with regards the current development proposal. Proposed rezoning of Commercial Zone 2 (retail and commercial uses only) to Commercial Zone 1 (retail, commercial and residential uses permitted). 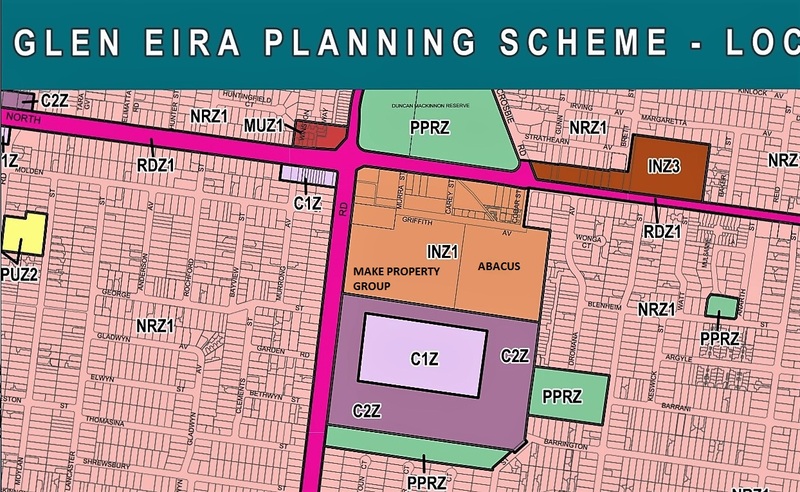 No change to Industrial Zones (Make Property Group and Abacus). Development plan included provision of 4,600+ dwellings, large retail outlets (e.g supermarkets, Bunnings), limited office/commercial usage. Council presentation of Planning Scheme Amendment C126 information to residents strongly criticized – presented as a simple commercial zone change without indicating the potential impact of the residential component (ie. C2Z – no residential usage vs. C1Z – residential usage permitted). Expansion of retail and residences ( 4,600+) diminishes office and commercial usage and therefore limits employment opportunities. Landlocked site with inadequate public transport (bus only) and restricted site vehicles access (already congested East Boundary Road only) . In the absence of qualitative information, many questions remain unanswered.